The purpose of a Key Fabric is to define your color palette and desired look or feel of a room. And you must LOVE it! This step is optional, but really fun! By selecting a 2nd Key Fabric, a totally different look and feel can be developed. 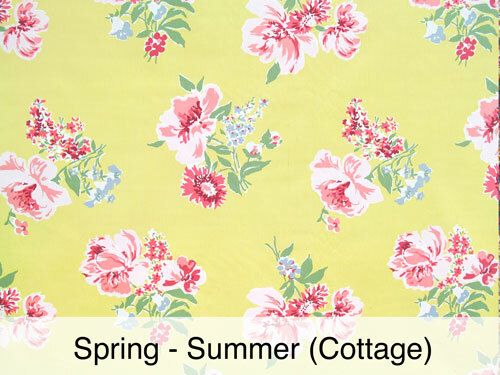 Perhaps you like a Cottage décor and your husband/partner/alter-ego likes a more Modern look…choosing a second Key Fabric allows him/her to have what they want as well without ever having to compromise or water down the other person’s style. We can develop a completely reversible ensemble so that with a quick change, the entire room can be transformed! 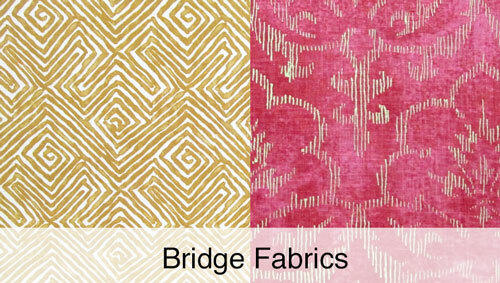 A Bridge Fabric is a fabric that works with both Key Fabrics. 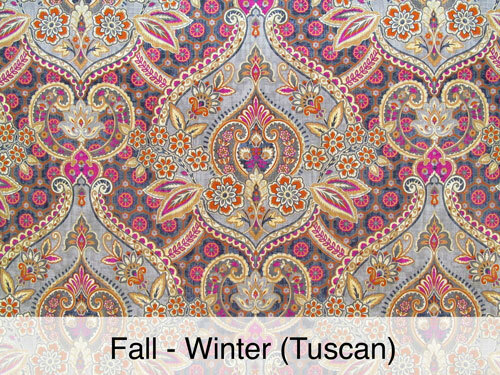 This is the fabric that will transition your décor from one look to the next. This can be a solid, a stripe, a plaid, a check, and even a floral or large print. You may want to choose fabrics with varying durability, as the bridge fabric is best used on things that aren’t easily changeable or are costly to switch out: upholstery, drapes etc. The possibilities are endless, so think outside of the box on this one! Choosing Coordinates is a fun step. This is where you can really let go and just collect, collect, collect. Don’t eliminate anything too soon – that process comes along in the next step. 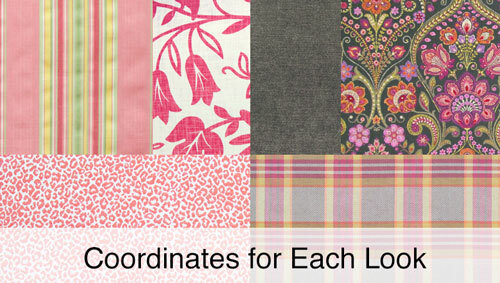 You can have as many coordinates for each side as you like, however, we usually recommend at least 3 to get started. Now you really have to decide on some things. This step can take a little time, but with a few tips we can make it a lot easier. First of all, what projects do you have in the room? For upholstery, you want to choose something durable – so assign a fabric that is suitable for upholstery. For drapes, you probably want something light weight and easy to move back and forth. For pillows, you can choose just about anything, so put those bold coordinates in small items to pack a punch. From there, you just have to decide what fabrics you like best and eliminate the others. In ensemble, we used our Bridge Fabric™ (Decor – Raspberry) on the drapes because it works beautifully with both the light and airy floral, as well as the darker tuscan print. Drapes are usually a great place to put a Bridge Fabric™ because they are expensive to change out – so this way we can get the most use out of the fabric. We also used this same fabric in small details like pillows to pull everything together. We used our main Key Fabrics™ on our changeable Chameleon Fine Furniture™ Rachel Chair. In this case, all of the furniture we make at Chameleon is slipcovered furniture, so it’s easy to change out a cover for a whole new look. For the sofa, even though our Lielle Sofa is a slipcover, we used a more practical, durable fabric. Most people have an upholstered piece of furniture in their homes. If you have a piece of furniture that gets a lot of use, we recommend choosing a durable fabric for this piece. Now it’s time for you to put Chameleon Style® Design concepts into action to create your own changeable decor that is flexible, affordable, and fun!